We've now reviewed all 13 Gothitropolis Ravens (even though only two of them were actually ravens), and showed you their wings in all six colors. We've discussed the optional Battle Pack, with its helmet and sword and alternate head. We've even reviewed the set of bones. So you'd think we'd be done with this now, but there's still one final thing to come out of the Kickstarter that requires our attention. 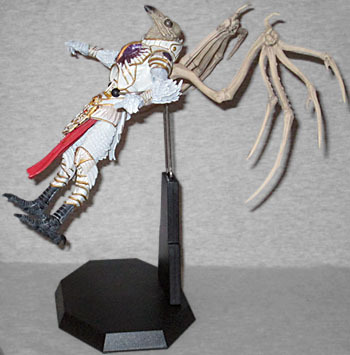 The final stretch goal unlocked, once this $65,000 project reached the $185,000 mark, was figure stands. 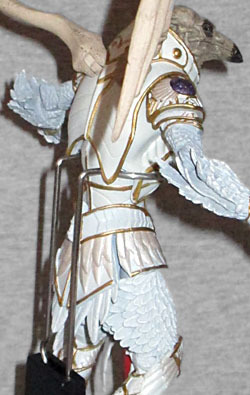 The figure stand is not Gothitropolis-specific. 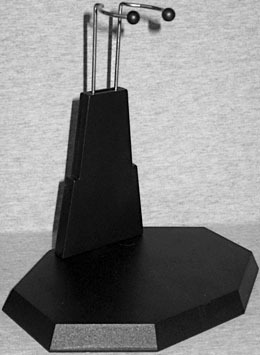 It's an entirely nondescript black hexagon with a beveled edge. The base is 5½" wide, 3⅞" deep, and half an inch thick. 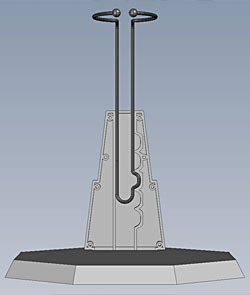 At the rear of the base, a slot and two holes support a 3½" tall black post, which tapers (in two tiers) from 2¼" at the base to 1" at the tip. If you want extra security for your figure, the holes in the bottom can accommodate screws, to really hold the twp pieces together securely. Finally, there is a metal arm that fits into the post. It's got a C-shaped grip with plastic balls on the end for safety, and is adjustable from 3½" to 6⅛" above the surface of the base. It's worth noting that so far, these have all been shipped with the metal arm in backwards - instead of clicking into one of its six preset notches, it just slides smoothly up and down. All you have to do is take it out and turn it around to enable full functionality. The C-grip holds the figure loosely - like a doll stand, this is more about making sure your toys don't fall off the shelf than it is about creating highly dynamic poses and battle scenes. 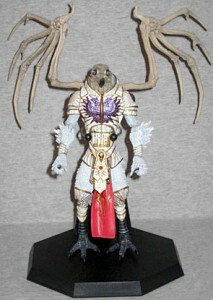 It definitely works with the Ravens, but can also accommodate Scarabus or Seventh Kingdom figures. But why stop there? NECA, DC, Marvel... nearly anything in the 5-9" range will be able to make use of this stand. There is one problem with the design, however. 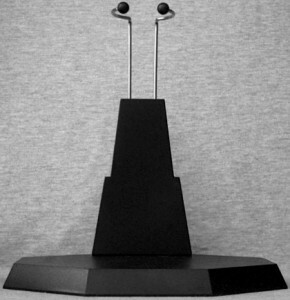 Since these stands were first available with the Ravens, many fans are going to want to use them to make the birds fly. Unfortunately, because the clip only holds the figure gently, and adding wings moves the center of gravity back, the birds tip backwards. That's great, if you want to have them thrusting their feet at an enemy, but it's rough if you're looking for majestic flight. Even the bone wings (which, as Monkey Boy pointed out, are much lighter than the fully feathered sets) have this problem. Our suggestion? Tip the chest forward as far as you can, and hook the two lower edges of his armor around the metal arm. It's not a perfect solution, and it won't work for every toy, but it will at least help your birds not look as lazy. Stop reclining, birds! You're meant to be fighting! Six years ago, Artemis craved bases to keep the Cat Warriors standing, and finally, the Four Horsemen have delivered. The base will have a substantial footprint on your shelf - it'll be tough to get figures to stand near one another - but they're big enough to support even fairly sizable toys without getting pulled over. This entry was posted in blog exclusive review, Four Horsemen and tagged Gothitropolis, Seventh Kingdom. Bookmark the permalink. I managed to get some decent flying poses. You just gotta move the C clamp higher up on the figure's torso. When it's high enough the figure's center of gravity will be forward enough to keep the figure from leaning back.